This Christmas wonderland served thousands of park visitors each year with its holiday cheer! We need your help creating this site. If you have any souvenirs, pictures or stories to contribute. Send us your photos, movies and videos of Santa's Village and we will put them on the website with you name along side! We are the fan site for SantasVillage.net. The last Santa's Village in Dundee, IL, closed 2006-2010, and has since re-opened 2011, we receive a wonderful amount of contact from lots of you wishing the park would remain open. We also received a good amount of angry email as well from people who had bought season passes to that park. Those folks were desperate to find help, and when the Dundee park too down its website ... we bore the brunt because people mistook our historical fan site for the now defunct Dundee site. So, we decided to redesign this website in sepia tones and give it the historical look it deserves ... and for the record, we're not in aassociation with the old Dundee park owner. We desperately need photos and movies of your families experiences at any Santa's Village. We're also looking to locate all the old rides ... where are they now? If you know where some of the old rides are, please contact us with the information and we'll mention you in our historical accounting. Have you seen a toadstool/mushroom in a neighbor's yard? Grab a photo of it and send it on to us. The image we've used on the header of this page is an areal view of the Scotts Valley/Santa Cruz Santa's Village on opening day 1959. All that you see there is gone now lost to fires and bulldozers, but the memories live on through your photos and your letters. Please do contact us! Santa's Village takes great pride in presenting the book that commemorates the Dundee Santa's Village in Illinois. It's written by the last Santa Claus of the Santa's Village parks, and his historical knowledge of all the parks will delight you with insidghts and memories alike. Get your copy of Santa's Village here. Since 1959, Santa’s Village in Dundee, has entertained millions. The park was born of a man who as a child had no real Christmas. Glenn Holland grew up in California during the Great Depression. His parents died by the time he was 18 years old, leaving him to care for his younger sister. As a father, he tried to give his own children the type of Christmas that he only knew in his dreams. In the early 1950s, struck with inspiration, Holland sat at his kitchen table one day and started to sketch his idea for a Christmas fairyland where all the magic of the holiday would come to life: Santa’s Village. Holland and general contractor Putnam Henck built three Santa’s Villages, two in California and one in Dundee. Phillip L. Wenz is the Dundee Park’s resident Santa Claus and official historian. Besides his duties at Santa’s Village, Wenz has been seen in numerous televised parades and national holiday events. 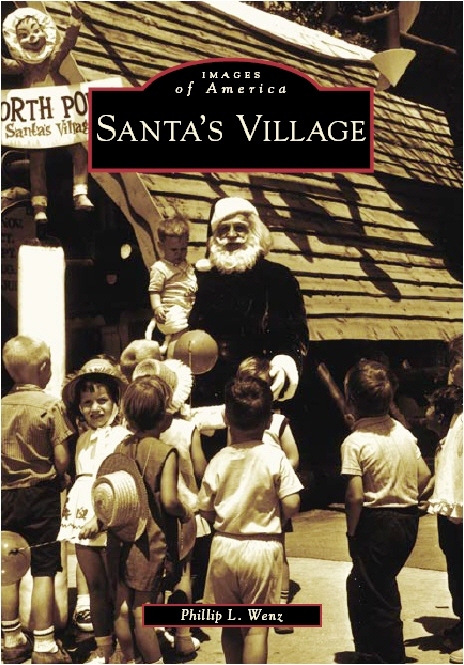 Utilizing his personal collection of pictures, memorabilia, and rare park photographs, readers can once again reminisce about the fun of Santa’s Village throughout the years. It is all here, the Christmas Tree Ride, the twirling Snowballs, Santa’s House, and the Frozen North Pole.